CHICAGO--(BUSINESS WIRE)-- Tianfu Minyoun Hospitality (Tianfu Minyoun) and Hyatt Hotels Corporation (NYSE: H) today announced that Hyatt and Tianfu Minyoun entered into a strategic development agreement to drive the expansion of Hyatt Place and Hyatt House hotels in China. The franchise agreements for the first three Hyatt-branded hotels under this strategic development agreement were also signed on the same day. 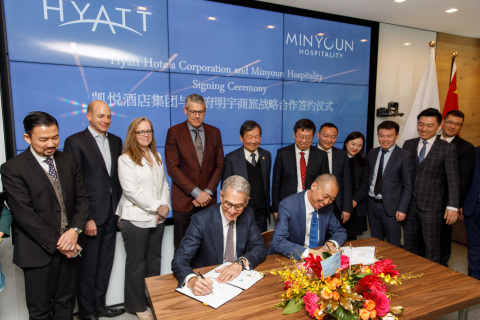 As leading hospitality companies in China and the United States, Tianfu Minyoun and Hyatt will bring together their resources and leverage their respective strengths for the development of Hyatt Place and Hyatt House hotels, with plans to bring both brands to more vibrant business and travel destinations throughout China. Under the strategic development agreement, 50 Hyatt Place and Hyatt House hotels are expected to be developed by Tianfu Minyoun and in cooperation with Chinese investors over the next five years, the first of which include Hyatt Place Nanchong Gaoping, Hyatt Place Changchun Jingyue and Hyatt House Changchun Jingyue. The three hotels will be operated and managed by Tianfu Minyoun. Additionally, Tianfu Minyoun is also planning to develop hotels under The Unbound Collection by Hyatt and Hyatt Centric brands in unique and attractive destinations across China. Once open, these hotels will be part of Hyatt’s loyalty program, World of Hyatt. Guests will be able to earn World of Hyatt points and redeem for free night awards and access many other benefits at Hyatt locations worldwide. As a testament of this relationship’s capacity, Tianfu Minyoun has also secured a credit line of RMB 30 billion from Sinhuan Tianfu Bank, which would go towards the construction and renovation loans for hotel owners of the projects contemplated by the strategic development agreement. Tianfu Minyoun has also teamed up with Road King Investment Group to establish a RMB 10 billion industrial fund to support the agreement. Minyoun Hospitality is a leading hotel group in Asia that provides services to both business and leisure travelers. It is engaged in creating an inspiring life and presenting unique experience for the new generation of travelers. The group has six distinctive and well-known hotel brands – Minyoun Pavilion Hotels, Minyoun Hotels & Resorts, Galaxy Minyoun Collective Hotels, LIA! By Minyoun, LIA! Selective by Minyoun and UHO Hotels – and several restaurant brands including Minyoun Yipalace, Minyoun Souphouse and Heqing Asian Restaurant. Fifty hotel and resort outlets are operating in 25 international tourism destinations in China, Thailand, France, and Fiji. Thirty-one of them have already opened and won numerous industry awards. Minyoun Hospitality will further expand its business operations and launch more high-quality business and tourism projects in carefully selected destinations in the worldwide at large. For more details, please visit minyounhotels.com. Hyatt Hotels Corporation, headquartered in Chicago, is a leading global hospitality company with a portfolio of 14 premier brands. As of December 31, 2017, the Company's portfolio included more than 700 properties in more than 50 countries across six continents. The Company's purpose to care for people so they can be their best informs its business decisions and growth strategy and is intended to attract and retain top colleagues, build relationships with guests and create value for shareholders. The Company's subsidiaries develop, own, operate, manage, franchise, license or provide services to hotels, resorts, branded residences, vacation ownership properties, and fitness and spa locations, including under the Park Hyatt®, Miraval®, Grand Hyatt®, Hyatt Regency®, Hyatt®, Andaz®, Hyatt Centric®, The Unbound Collection by Hyatt®, Hyatt Place®, Hyatt House®, Hyatt Ziva™, Hyatt Zilara™, Hyatt Residence Club® and exhale® brand names. For more information about Hyatt Hotels Corporation, please visit www.hyatt.com.